A bank robbery theme might not seem like the most original idea but there are at least plenty of other reasons to like Microgaming’s Bust The Bank slot game. The five reel and three row slot adopts the popular 243 ways to win format and boasts really fun graphics, animations and sound effects, which mean it does the bank robbery theme more justice than most. The game, too, gives players a really wide choice when it comes to how much to bet per spin and packs in additional features, like wild symbols, bonus rounds and free spins. Every winning combination results in really fun and engaging animations on the reels, which are accompanied by sound effects and give the game an extra edge. The game includes not one but two different bonus rounds to add extra interest to gameplay and also awards random bonus prizes courtesy of its bank robbing main characters, Bob and Larry. Potentially very lucrative free spins, where reels one and five are both wild, can be triggered thanks to the slot’s scatter symbol. Whilst Bust The Bank carries it off pretty well, the overall bank robbery theme is a pretty standard and well-worn one. Away from the bonus rounds and free spins, the slot’s jackpots are perhaps a little disappointing and make the game a little less generous than many similar alternatives. There are two different bonus symbols which, if they appear in the right place on the Bust The Bank reels, can trigger two diverse bonus rounds. If the game’s Safe symbol appears in any position on reels one or five, the Safe bonus is triggered and players have the chance to win coin value prizes. 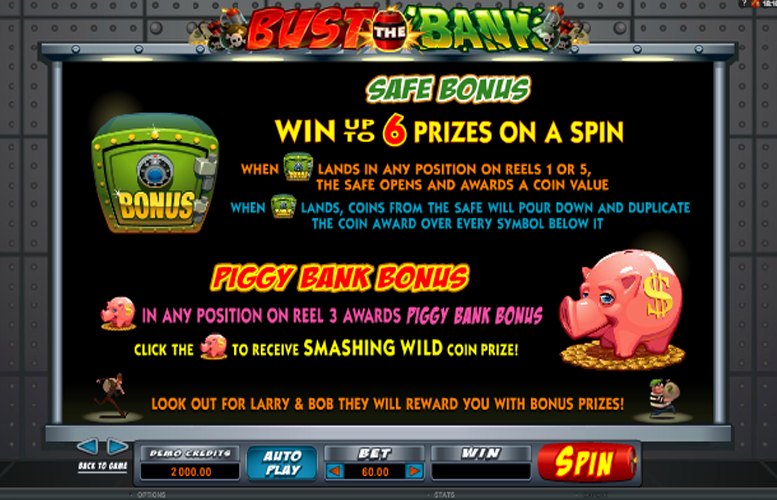 If the Piggy Bank symbol appears in any position on reel three, meanwhile, a player can click the resulting Piggy Bank to receive a ‘Smashing Wild Coin Prize’. 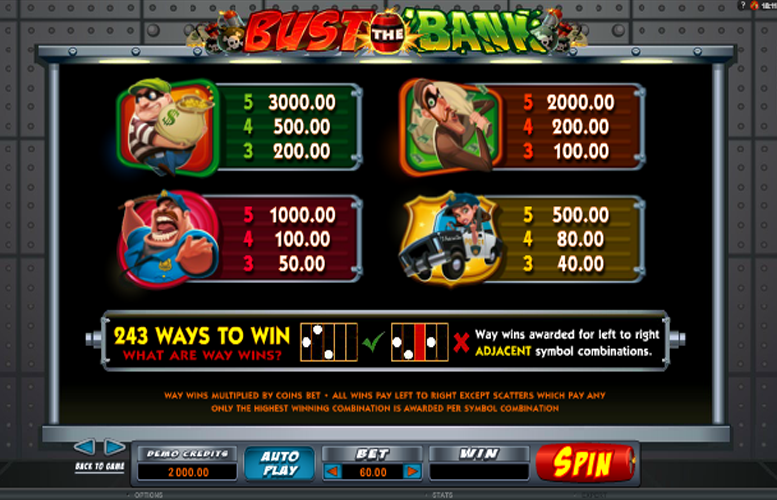 Players should keep an eye out for Bob and Larry whilst playing Bust The Bank, too, as they can suddenly appear and provide bonus prizes. 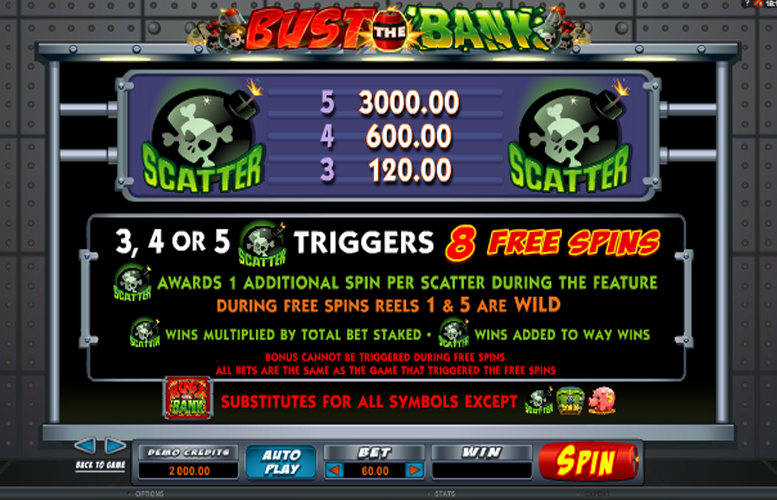 If three, four or five of the slot’s Bomb Scatter symbol appear anywhere on the reels, it triggers a set of eight free spins. During those free spins, both reel one and reel five are wild reels and whenever another Bomb Scatter appears it adds an extra free spin. As and when Bust The Bank players want to change the size of their bet per spin, they have two ways of doing so. They can alter the number of coins they wager on each spin and can choose how much they want each coin to be worth. Between a minimum of one and a maximum of ten coins can be bet on each spin and the value of each coin can be set at anywhere from 1p to £2. As the slot is a 243 ways to win format game, the chosen bet amount then always has a 30x bet multiplier applied to it. That means that the minimum possible bet is 30p and the maximum is £600. 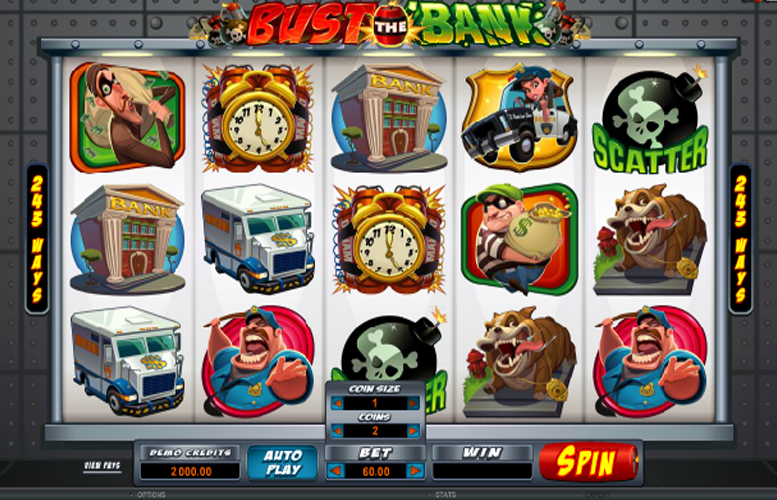 It would be tempting to see that Bust The Bank is yet another bank robbery themed slot and to simply write it off on that basis. You’d be missing out if you did, however, as it is definitely one of the better slot’s within that over-populated genre. The game utilises the theme really quite well, and has added features such as animated symbols and two bonus games to keep gameplay really interesting. Those bonus rounds, along with wild symbols and free spins, also help to boost the winning potential of the slot and largely mitigate the somewhat disappointing main game jackpots. A final area where Bust The Bank excels, too, is in providing players with a really wide variety of potential bet sizes. Lower budget players, after all, can bet just 30p per spin whilst higher rollers will be happy with the £600 maximum limit. This game has a rating of 4 / 5 with 596 total reviews by the users.